Let the Delray Upholstered Swivel Bar Stool help you make use of your kitchen counter space, offering the most comfortable seat for meals, snacks and more. Providing the level of comfort you would expect from an armchair, the Delray is plush, pleasing and perfect. Handcrafted by the best in the business, this country style furniture comes to your home from a wood shop in northern Indiana. Let the swivel in the seat support you as you eat and enjoy time with family and friends in the kitchen. Swivel bar stools allow you to glide right into your seat without having to pull it out from the bar. The Delray makes a great choice for sewing projects in your crafting room, with the swivel action providing easy movement from table to machine. Be sure to enjoy our blog post, Beyond the Bar: Other Uses for Bar Stools for more suggestions on bar stool seating throughout your home. 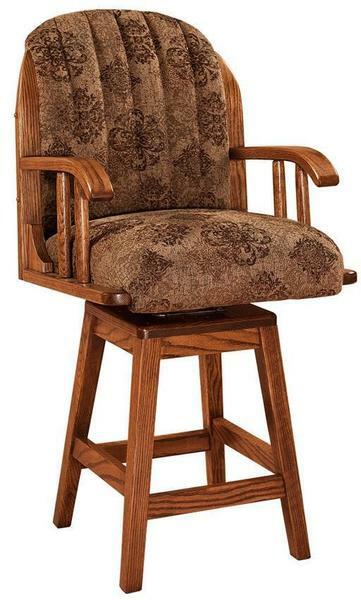 With a sturdy frame cradling you in this plush seat, the Delray is yours to design. Choose from 9 wood species as well as the finish you like best. Each bar stool is hand sanded to create the smoothest finish. Consider fabric or leather upholstery and a 24" counter height or 30" bar height. The Delray is also available in a desk chair. Seat Height from Back: 18"